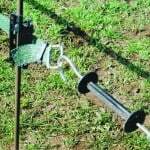 A few basic rules need to be followed when installing and using the Fieldguard system. The 40mm tape requires a support every 5m; 20mm tape requires a support every 7m. As tape is light it requires the thinnest line stakes possible. 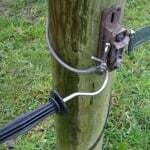 When secured to wood posts, it is recommended that the insulators (R8) are screwed (R8X) on using a Philips screwdriver or, much the best, a cordless screwdriver. When putting the insulators (R8) onto the glass fibre stakes (R7), always use a heavy club mallet. It is also wise to wear protective glasses. 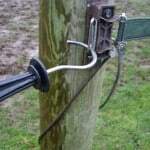 The R13 insulators are hammered into the side of existing wood stakes and can be quickly removed with a claw hammer. 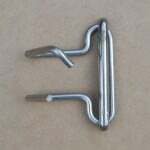 When attaching tape to the gate handle, first feed tape through the flat rings and then feed it back through the middle of the two rings. The tensioners (R36V) and corner insulators (R45V) have large flanges at the top and bottom. These should be ignored as they are moulded for North American use. 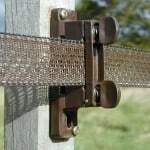 To make a T-junction in a wide tape run loosen the run and take one insulator away from the fence at the required point, substitute a tensioner (R36V) with the T-junction wire (R36T) already in place in the tensioner. 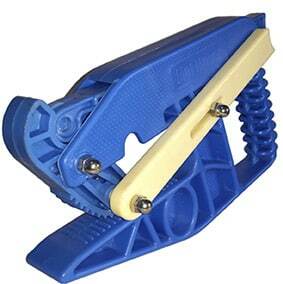 The R36V tensioner is used for all normal corner applications, including R13 extended insulator runs. Never apply power directly to a tape as it will burn through the filaments in time. A power connector (R59C) should be used to connect power between tapes. 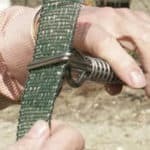 To join tape with a buckle, follow the same procedure on each side of the buckle. Battery energisers in fields are a ready target for thieves. It is advisable to hide them under old upturned dark-coloured buckets. The high voltage combines with the nylon in the tape to produce a mild form of chlorine gas that attacks and oxidises all metals.